Bob is a MA student in the field of New Media at the University of Amsterdam. During his first year of studying 'Communication and Information Studies' at the University of Utrecht he stumbled upon the subject of New Media, what would change his career as a student. Particularly because he was dealing with a lot of new media in his own life (like most of his generation), he was wondering what kind of impact they have on him and the people around him, and what the future will bring. Luckily for him the University of Utrecht offered a trajectory called New Media and Digital Culture in which he enrolled, and next to that he started the Minor Cognitive Psychology. After finishing his Bachelor in Utrecht he decided to go to the city of Amsterdam. The University of Amsterdam offered the Master program ‘New Media’, which he started in September 2010. His main interest lies in the notion of ‘Googlization’, and currently he’s writing his thesis about the personalization of search results by Google, and how it affects society. 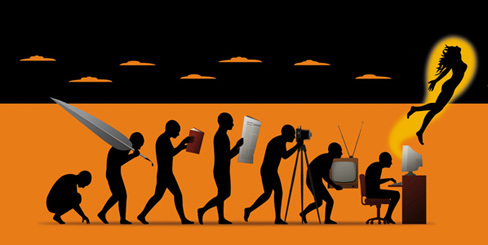 Since Darwin’s On the Origins of Species the idea of evolution through natural selection has been used in a variety of disciplines, even in the field of media studies. Different types of media are born (being a technical invention) and can become obsolete or converge into new media forms. During the last few years the evolution of media has brought forward several social media services, Twitter being one of these. This social networking and microblogging service is used in different ways, which implies that Twitter has a diverse set of specifications that are interesting for various target audiences. Some people use it in ways that do not correspond with the original intentions of the makers of the service, but why do these people use Twitter and not another service? Maybe it’s because there is no other service, yet, that can comply with their wishes. As the evolution of media goes on, will these alternative ways of usage lead to new services, and maybe make Twitter obsolete? In their paper The Natural Life Cycle of New Media Evolution Sam Lehman-Wilzig and Nava Cohen-Avigdor bring together the technological deterministic view of media and social constructionism in their theory of ‘media constructionism’, which states that “constant interaction between new and older media is a key factor in the successful or unsuccessful evolution and specific direction of the new medium.”. In this theory they also look at the diffusion of innovation, “the process by which an innovation [new ideas, opinions, or products] is communicated through certain channels over time among the members of social system”. The different kind of adaptors described by Everett Rogers play an important role in the evolution of a medium. The two researchers describe a life cycle model of new media, in which a medium has six different stages; birth, penetration, growth, maturity, self-defense/resistance, and adaption, convergence or obsolescence. We can safely say that Twitter has reached the stage of maturity; however it took more than a decade of evolving social networking sites to get there. Danah Boyd gives a short history of social networking services in her article Social Network Sites: Definition, History, and Scholarship. “SixDegrees.com allowed users to create profiles, list their Friends and, beginning in 1998, surf the Friends lists.” With SixDegrees the species of social networking sites was born, and soon many services followed that brought new features. But Sixdegrees was too far ahead of its time and turned out to be not that successful. After Sixdegrees most social networking services were focusing on meeting strangers, mostly because of the successes of dating sites, however in 2002 Friendster was launched, a service that focused on the friends-of-friends mechanism. The only downside according to the users was that Friendster didn’t allow you to view profiles of people who were four degrees away from you. Around 2003-2004 the social networking services began to hit mainstream. All over the Internet user generated content was growing, and by implementing a social networking service to it the Internet became more and more social. This was the time that also blogging services began to implement the SNS features. The services also were developing to become more open, everyone could see your profile. Meanwhile another web service was evolving alongside; microblogging. With its roots in IRC, chat message updates and mobile phones (Makice, 2007). Microblogging is “a form of blogging that lets you write brief text updates (usually less than 200 characters) about your life on the go and send them to friends and interested observers via text messaging, instant messaging (IM), email or the web.” (Akshay Java et al., 2007) . One of these microblogging services was Twitter. It was initialy meant as a service to send SMS to a small group of friends, however with the widespread success of social networking services that let you connect to everyone, Twitter became more than that. With only a handful of features Twitter is one of the most basic services around and yet has over 100 million users. The idea is that you answer the question what are you doing?, this status update is put on your microblog so people can read it, however you can also become friends with others (follow them) and their status updates then also become visible on your microblog. Your status update can’t be more than 140 characters and you can also provide links. The last feature Twitter brings is turning your profile on private so only your friends (followers) can see your tweets. This small amount of features however brings about many different kinds of usages. TinyURL9 is frequently used to make this feature feasible. to easy access to the developer API. However there are more, maybe less known, usages of Twitter. For example this study shows how Twitter can be used as a formative evaluation tool in education. Other examples of how Twitter is used in education can be found here (in Dutch only) and here. Other more strange uses of Twitter can be found here. But what about the future of Twitter? Being in the stage of maturity means that the next stage will be resistance. Alternative usages of Twitter could lead to birth of new medium, or penetration or growth of an already existing medium. Twitter has several options when this would happen; attack, cut the other medium off or adapt. One way to prevent the resistance stage would be to look at the alternative usages and to find out through this what people want, this way adaptation could come in time so the last stage won’t be reached. Understanding how and why people use services like Twitter will help us evolve the social networking and microblogging idea and improve both microblogging and social networking clients and infrastructure software. Mischaud, E. “Twitter: Expressions of the Whole Self,” Master’s Thesis. Department of Media and Communications (Media@LSE)., University of London, 2007.